The housemates delivered the whole African continent in splendid seven colours! They stuck to "the colours of Africa" theme very well. The evening presentation went on for a little longer than usual but was detailed with colourful and equally tasty dishes that the guests thoroughly enjoyed! The hotshots certainly deserved to win their 100% wager task! The night’s guests were the One representatives that came yesterday to teach the housemates about opportunities in agriculture for young people. Namely, One Campaign Executive, Dr Sipho Moyo, Former Miss Universe, Mpule Kwelagobe, and Commissioner Tumusiime Rhoda Peace. 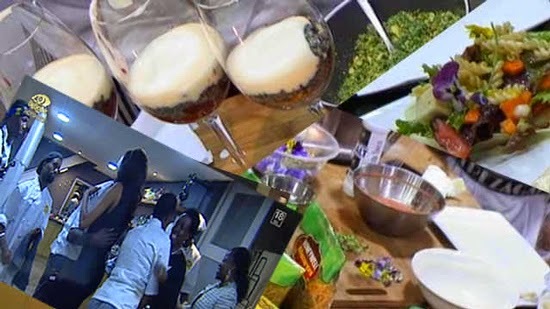 From the moment the guests walked in, the housemates received them warmly with Sheillah directing them to their seats and offering them refreshments. The entrée was soon in front of them and the guests quickly dug in. The starter followed, as did the main course and dessert. All the meals were colourful and displayed all the African countries which clearly got the attention of the guests as they almost chewed their tongues off! Housemates did a great job in incorporating the secret ingredient, Honeywell Noodles, in their courses and the noodles added that special extra flavour in all the segments of he four course meal. Mpule even complimented the hotshots and said that they were spoiling them with a four-star meal. The guests were also entertained throughout their experience in the house with some singing and dancing. Sheillah led the first segment of the entertainment for the guests. Some housemates joined the guest on the table and made conversation with them, continuing with entertaining the guests with more than just food. The evening went extremely well and it came as no surprise when Figgie confirmed that theirs was a tasty meal! With said, the store room was opened and the housemates dashed to pick up the drinks and the extra goodies that Figgie had placed in the store room. The housemates deserved their win and celebratory drinks and braai packs. well done and well prepared.